Long Hair light brunette has a gorgeous face! Her eyelash ridges will need a touch of paint. Nose dots are still visible. Her hair is shiny and long with no cuts and no missing hair plugs. Her original body is in nice condition with both legs bending and holding at 3 clicks. All fingers and toes are present. She has one pin prick on each foot. She's marked, 1958 MATTEL, INC.
MADE IN JAPAN (all raised letters) She's wearing the complete original Barbie outfit, "Benefit Performance #1667" in lovely display condition. The overcoat has both rhinestone accents. The underskirt has all layers and no holes but will need steaming as it is wrinkled from storage and gauze underskirt closest to body will need a couple brown age/storage spots removed. One tie is missing in back so I have a clear band holding. Gloves could use a gentle soak and red JAPAN shoes are good. Long Hair blonde has a beautiful face with bright face paint. 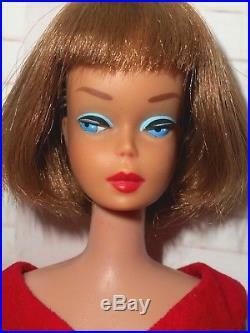 Her lips are beautiful but could use just a dab of paint on top lip edge if desired. Her hair is shiny and long with no missing hair plugs. It may have had a slight trim as there are different lengths but might just need styling. Her original body is in nice display condition with both legs bending and holding at 2 clicks. (indented) MADE IN JAPAN (raised) She has no pin pricks and no chew marks. 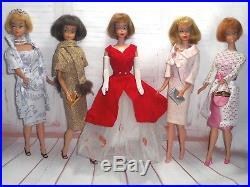 She's wearing the dress and jacket from Barbie's original outfit, "Fashion Luncheon #1656" in good display condition. The rhinestone looks like it was just glued on top of bent prongs so could use attention. The fabric around neckline of dress is starting to pull loose so could use a stitch or two. 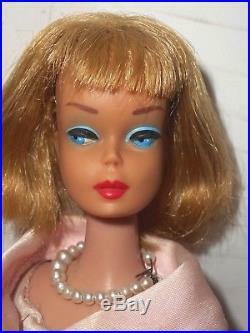 She wears a pair of JAPAN marked light pink open toe heels and carries a vintage silver purse. Light blonde has a beautiful face with nice face paint. There is a teensy tiny dot of eyeliner missing on right eye as shown. She has pin taps and pinpricks on both sides of face and a couple in front but all are hard to see in person unless you are looking for them. Her hair is thick and full with no cuts and no missing hair plugs. Her body is in good display condition with both legs bending and holding at 2 clicks. 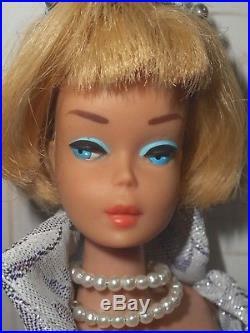 She is marked, 1958 MATTEL, INC.
(indented) MADE IN JAPAN (raised). She has all fingers and toes present but has indentations across a couple fingers and pin pricks and a couple teeth marks on feet/ankles/lower legs. The outfit is seamstress made and is gorgeous! Sadly, I lost all paperwork for this outfit so not sure who made it. Outfit includes: beaded headband, coat, dress, clutch purse, pearl necklace and JAPAN black heels. Long hair Brunette has a stunning face. Sadly, she has a chin nip and has a couple scratches around same area. The nip was filled but not perfect though still displays well at correct angle. Her hair is amazing - long, thick and shiny with no cuts and no missing hair plugs. Her body is in good display condition with both legs bending and holding at 3 clicks. She has a couple pin pricks around feet/ankles/lower legs. MADE IN JAPAN (all raised letters) She's wearing the fur trimmed scarf, jacket and dress from Barbie's original outfit, "Gold N Glamour #1647" in nice display condition. The scarf has some stitching along edge that is pulling loose and the dress will need zipper reattached in back and the hem tacked back up. I have a thin band around dress to hold closed. Also included is a vintage smooth gold clutch purse with pearl bead and a pair of brown JAPAN marked open toe heels. Titian hair has a beautiful face. She will need a touch up to left eye paint, lips could use a dab of paint and she has a couple pin pricks on left cheek. 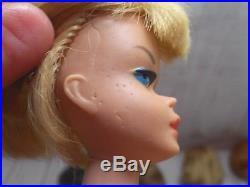 Her hair displays nicely but is missing plugs underneath in back as shown and sides have been trimmed slightly. She's on her original body in good display condition with both legs bending and holding position - left at 3 clicks and right at 2 clicks. She has many pin pricks around feet and ankles. She's wearing the pink sheath dress and overdress with bow from Barbie's original outfit, "Garden Wedding #1658" in good display condition. The dress shows play wear, zipper needs to be reattached and hem needs to be tacked back up. The overdress is lovely, just needs bottom hook replaced. I have a thin band holding it closed. She wears a pair of pink JAPAN marked open toe heels and carries the pink and gold purse with chain strap from her "Pink Premiere" outfit. I will include extra bands that I use for clothing and to help hold purses in their hands. 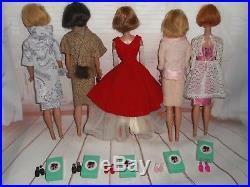 Also included will be shoeboxes, 3"x 3" larger boxes to hold hangers and accessories for each doll. All items are from a pet and smoke free home. 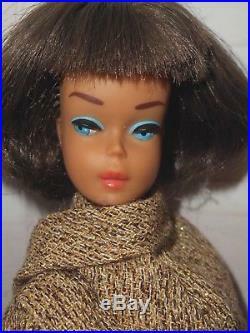 A wonderful addition to any vintage Barbie collection! Thanks so much for viewing our auctions! Please feel free to ask questions and/or request additional photos. The item "Vintage HTF AMERICAN GIRL BARBIE 5 DOLLS LOT + CLOTHES SHOES LONG HAIR & MORE" is in sale since Sunday, September 30, 2018. 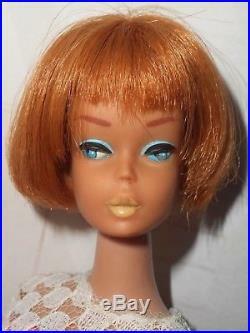 This item is in the category "Dolls & Bears\Dolls\Barbie Vintage (Pre-1973)\Vintage (Pre-1967)". 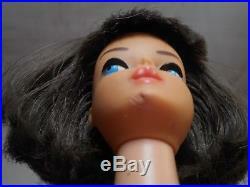 The seller is "hanginwithbarbie" and is located in Burtonsville, Maryland. This item can be shipped worldwide.